Healthcare reform bills pending in the United States Congress in 2009 generally force employers either to provide health insurance for their employees or pay the government to subsidize the healthcare those employees are nonetheless expected to receive. This Demonstration puts you in the role of an employer and shows the financial consequences of providing health insurance or declining to do so in 2014 and beyond. It does so under the two leading reform contenders: H.R.3590, the Patient Protection and Affordable Care Act (Senate), and H.R.3962, the Affordable Health Care for America Act (House of Representatives). Basically, H.R.3590 requires many employers not providing compliant health insurance to pay an assessment of $750 per employee. H.R.3962 imposes a payroll tax from 2% to 8% on many noncomplying employees. A large number of parameters affect the financial consequences of the employer's choice. You set the effective marginal tax rate faced by the employer; this is important since both contributions to insurance premiums and payroll taxes are generally deductible for federal and state income tax purposes. You set the number of employees the employer has; this number can affect whether the employee is subject to the H.R.3590 assessment and indirectly affects the size of the payroll tax. You set the percentage of employees that elect to purchase healthcare coverage if you make it available. You also determine, via the "individual ratio" control, the percentage of electing employees who elect individual coverage rather than family coverage; premiums for this group are significantly less than for those purchasing coverage for their entire family. You then select four characteristics relevant to the cost of health insurance provided by the employer: the premium charged for individual coverage, the percentage of individual premiums paid for by the employer, the premium charged for family coverage, and the percentage of family premiums paid for by the employer. 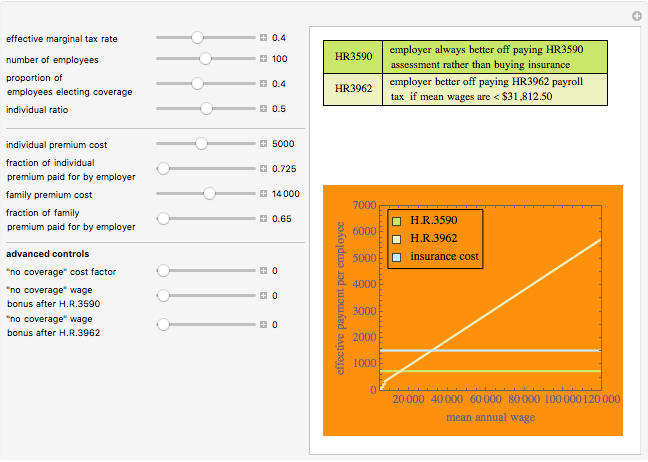 The Demonstration outputs a table showing, for both of the reform proposals, the circumstances under which an employer would be financially better off (a) providing health insurance coverage or (b) refusing to provide compliant coverage and just paying the government instead via an assessment or payroll tax. It also shows a graph showing the cost of three scenarios—(1) paying an assessment under H.R.3590; (2) paying a payroll tax under H.R.3962; and (3) provision of health insurance—for varying levels of the mean wage the employer pays to its employees. There are also three advanced controls. The "no coverage" cost factor control sets the indirect costs to the employer from declining to provide insurance coverage to employees; these costs might include demoralization, loss of skilled workers to other jobs, and sicker remaining employees. The last two advanced controls relate to the choice an employer would retain under both health reform proposals to decline to provide insurance and instead pay the government an assessment or payroll tax. Neither reform proposal creates any impediment to the employer paying the worker a wage "bonus" instead of providing health insurance coverage. The controls in the Demonstration permit you to set the size of such bonuses under either H.R.3590 or H.R.3962. By manipulating these controls in conjunction with the other controls in the Demonstration, you can explore how large a bonus the employer could pay out and be no worse off than it is providing coverage today. Increasing these bonuses reduces the indirect costs that may be occasioned by the employer's decision not to provide health insurance coverage. The model developed here does not consider the proposed addition of section 45R to the Internal Revenue Code that would provide a tax credit to certain small employers for purchasing health insurance on behalf of their employees through one of the "Exchanges" established by the reform bills. Precisely modeling the indirect costs occasioned when an employer declines to provide health coverage to its employees is difficult. This model assumes that such costs are a user-selectable coefficient multiplied by the difference between the total average premiums the employer would have paid for coverage and any "bonus" the employer chooses to provide the employee after dropping coverage. The provisions underlying this Demonstration may be found in section 1513 of H.R.3590 and section 512 of H.R.3962. Although there are many exceptions, health insurance in the United States frequently comes in two "flavors": individual coverage provides health insurance only for the purchaser; family coverage provides health insurance for the purchaser and for certain members of the purchaser's immediate family. Seth J. Chandler "Employer Health Insurance Choices under H.R.3590 and H.R.3962"